Eleanor & Park - Rainbow Rowell - Eleanor is the new girl in town, and she's never felt more alone. All mismatched clothes, mad red hair and chaotic home life, she couldn't stick out more if she tried. Then she takes the seat on the bus next to Park. Quiet, careful and - in Eleanor's eyes - impossibly cool, Park's worked out that flying under the radar is the best way to get by. Slowly, steadily, through late-night conversations and an ever-growing stack of mix tapes, Eleanor and Park fall in love. The Love Song of Miss Queen Hennessy - Rachel Joyce - When Queenie Hennessy discovers that Harold Fry is walking the length of England to save her, and all she has to do is wait, she is shocked. Her note had explained she was dying. How can she wait? Big Little Lies - Liane Moriarty - Single mum Jane has just moved to town. She's got her little boy in tow - plus the secret she's been carrying for five years. On the first day of the school run she meets Madeline - a force to be reckoned with, who remembers everything and forgives no one - and Celeste, the kind of beautiful woman who makes the world stop and stare, but is inexplicably ill at ease. They both take Jane under their wing - while careful to keep their own secrets under wraps. 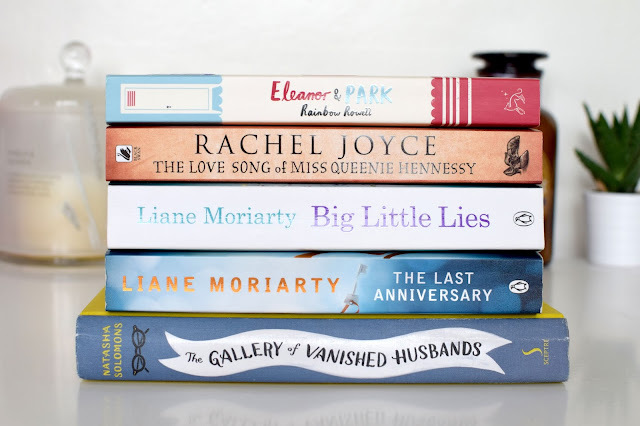 The Last Anniversary - Liane Moriarty - One abandoned baby. Two sisters with a secret. One chance to rewrite the past.Over seventy years have passed since sisters Rose and Connie Doughty found an abandoned baby near their home on the island Scribbly Gum. With no one to take care of it, Rose and Connie took the baby in as their own. Since then the 'Munro Baby Mystery' has brought fame and fortune, putting Scribbly Gum on the tourist map, especially for the island's annual celebration. But now, with Connie dead and outsider Sophie Honeywell about to move into her home, Rose begins to wonder if they made the right decision all those years ago. How much longer can they cover up the lie that has sustained their community for generations? And what other secrets are about to be revealed? The Gallery of Vanished Husbands - Natasha Solomons - At thirty a woman has a directness in her eye. Juliet Montague did anyhow. She knew exactly what she wanted. She wanted to buy a refrigerator. But in a rash moment, Juliet commissions a portrait of herself instead. She has been closeted by her conservative Jewish community for too long, ever since her husband disappeared. Now she is ready to be seen. So begins the journey of a suburban wife and mother into the heart of '60s London and its thriving art world, where she proves an astute spotter of talent. Yet she remains an outsider: drawn to a reclusive artist who never leaves Dorset and unable to feel free until she has tracked down her husband - a quest that leads to California and a startling discovery. I've read Eleanor & Park recently and it was such a good book - hope you enjoy it! I love Eleanor and Park such a good book worth the read.